In this series on Zeppin, we will focus not only what they are but how they are created and their history. 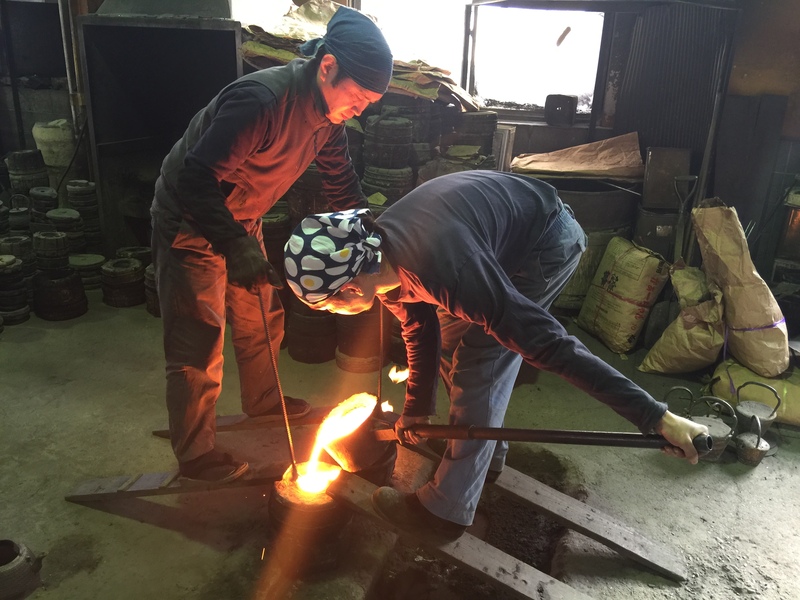 For the first item of our series, while we were still enthusiastic, we decided to strike while the iron is hot and write about the much loved cast ironware of Iwate. In particular, we decided to look at the style known as Nambu Tekki (南部鉄器) which refers to all ironware made in the former Nambu region. The history of cast iron pots also known as 鉄瓶　(tetsubin) in Japan is said to go back to the 17th century when Sencha (leaf green tea) was introduced to Japan from China. However, when we trace the roots of Nambu Tekki specifically in Morioka City Iwate Prefecture, it leads us back to the Nambu Clan leader Nobunao Nambu, who lived during the tumultuous Sengoku period(戦国時代) to Azuchi-Momoyama period(安土桃山時代) of Japan’s feudal system, and towards the end of his life, ruled the Iwate and Aomori regions which were called the Nambu Chiho. The Shogun is said to have loved tea ceremony and invited a Kamashi(釜師), teakettle craftsman from Kyoto, to produce kettles for them. The kettles were named Nambu Kama(南部釜) which became the roots of what Nambu Tekki has blossomed into today. Under the clan’s patronage, and also being blessed with the good fortune to have all the ingredients and materials to make the ironwares already available in the region, the cast iron industry bloomed. The traditional craftsmanship has been honed for over 400 years and is still being practiced today. So why was this craft particularly successful in the remote north of Japan? We went to the Iwachu (岩鋳) factory, the largest and most renowned manufacturers of Nambu Tekki, in Morioka City to find out. The company Iwachu was established in 1902, and has been producing Nambu Tekki for over 110 years. They manufacture over a million cast iron products in a year and are most known for their breathtakingly colorful teapots that have now become the face of the brand overseas. It is an often-repeated fact that these colorful teapots were the key to Iwachu’s survival and continuous success as a company. 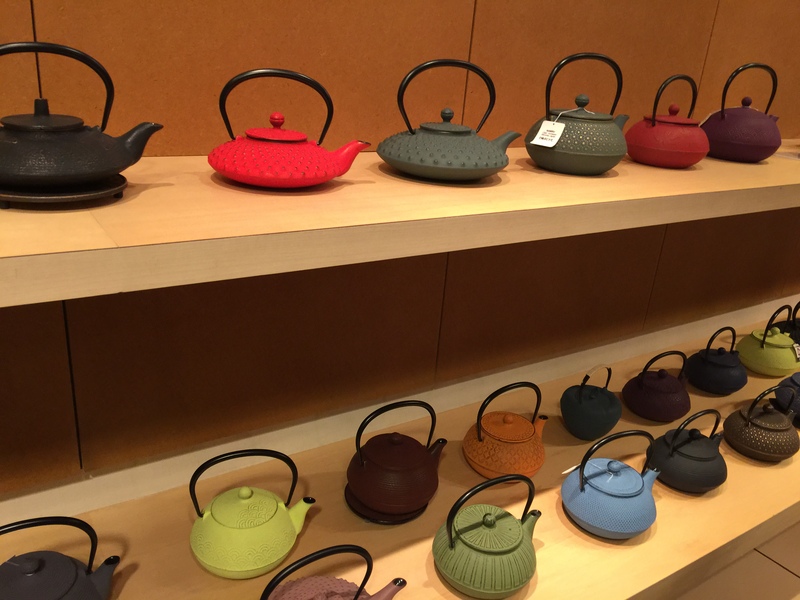 Kiyomitsu Takahashi from Iwachu sales department recalls, in 1996, a tea specialty shop in Paris requested them to produce the colored teapots which were traditionally black or brown. After 3 years searching for the right pigment and technology, the pots became an instant hit in Europe. Currently their products are sold everywhere from Europe to USA to all over Asia including China. Another reason for their popularity is the health benefits that come with using the ironware. When you boil water in these kettles, the iron seeps out into the water thus enhancing your intake of iron. When you make tea in these kettles, the tannin in the tea reacts with the iron resulting in browner coloring but a milder taste rid of the chlorine in the water. We took a look in the studio where the pots are handmade one by one. 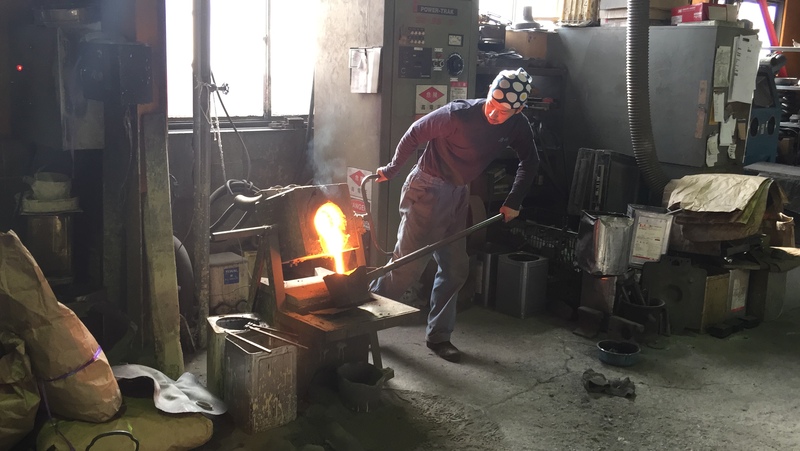 One of the two certified Traditional Craftsman Akira Yaegashi at Iwachu, the third craftsman to receive the honorary title of Kiyoshige(清茂), took us through the process step by step. Once the mold is shaped, the etchings of the patterns begin, perhaps, one of the most impressing things about the process. The work is painstakingly time consuming and requires extreme concentration and intricate technique for manually etching the signature dot patterns(known as the “Arare”(あられ)) with machinelike accuracy. Yaegashi has been making these molds for 23 years and yet he claims, he is never sure he has got it “right” but what he does know, is how he presses onto the patterns decides the outcome of the pots. “If I have a decisive touch, they come out proud looking and vice versa but there’s never a happy coincidence. For all the preparation that goes into this, if you don’t do a good job, it will show up in a split second.” Our editor in chief, Jake Adelstein, at Yaegashi’s invitation, took a stab at etching the dot patterns. Patiently observing his struggle, Yaegashi, nodded and said, “If it had been for real, you would have already broken the mold. Haha.” It appears Adelstein will not be leaving leaving journalism to work as an artisan anytime soon. When the patterned mold is completed and put together, the iron is melted in an electric oven at 1600 degrees. 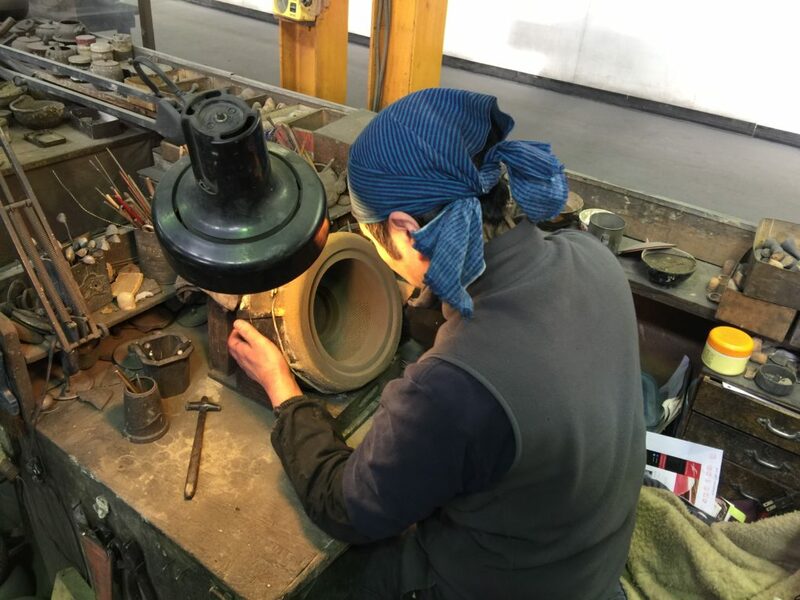 It is poured into the mold with great care by two craftsmen, and is lit on fire after the iron is poured to do away with the gas that is produced inside the burning mold. Around the time the iron has settled, the mold is taken off and is left to cool. Then comes the coloring. The pots are heated up again to about 250 degrees so that the lacquer can be applied to the surface. The lacquer is followed by a concoction of tea and rust on a 150 degrees pot which works as the anti-rust protection. As a finishing touch, the raised surfaces of the dotted pattern receive an extra lacquer towel rub, thus creating a shiny raised surface opposed to the matt texture of the tea and rust cover. This, according to the craftsmen, was supposed to express the “Wabi-Sabi(侘び/寂び)” nature of all things, which is a theme in tea ceremony, also known as a moving form of zen. All in all it is a sixty step process necessary to complete the creation of a cast iron teapot. It is clear to the eyes, that these are not skills that can easily be taken over by machines. Every step requires a human eye or hand to instinctively assess the progress. For instance, the handle of the teakettles are not one piece of iron but instead, a thin slab of iron rolled into a straw like state, in order to avoid the handle getting too overheated. Such attention to detail is the trademark of Japanese craftsmanship. 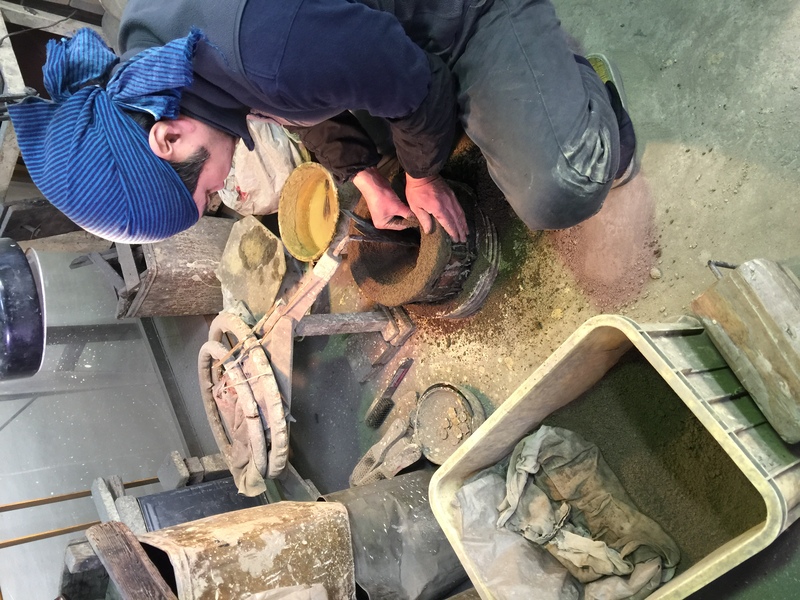 Indeed, to become a certified Nambu Tekki Traditional Craftsman, one must master the art of woodworking, iron casting, engraving, pottery and lacquering—essentially every Japanese craftwork. This, in a time of automation may seem inefficient, however for Iwachu, it adds that special layer value and prestige. This is why some of the finer kettles can be sold for as much as 300,000 yen ($3000) and tea ceremony sets that go as high as 600,000 yen($6000). As they work to keep up with the high demand, the in-house design team are actively collaborating with foreign designers from other brands to keep the showrooms vibrant and chic. They have even collaborated with designers from Finland to make new iron ware that marries the best of traditional Japanese craftsmanship with modern Scandinavian aesthetics. 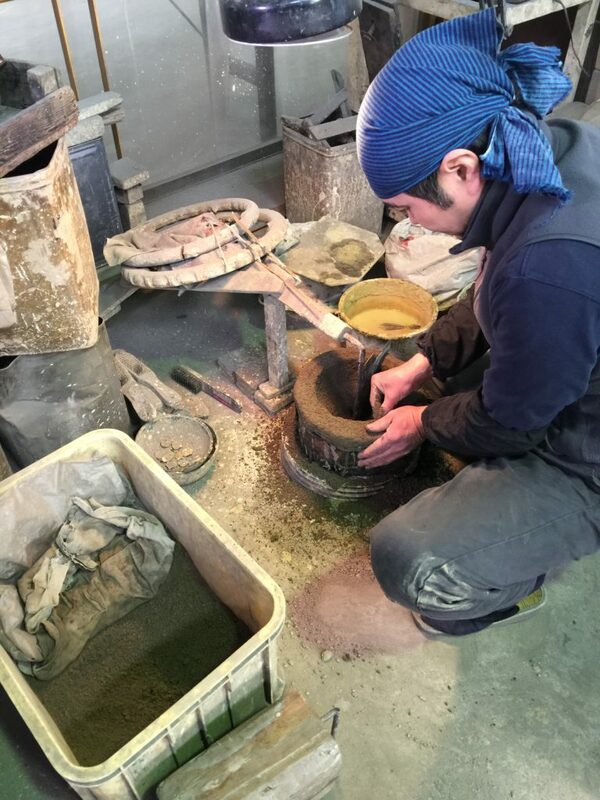 The traditional methods being practiced at Iwachu are not in danger of being lost but at present they are only used in less than 10% of what the company makes. The company does modernize a bit as well. When we visited, they were sold out of their hottest variation of the traditional tea making pot, known as a kyusu (急須) —an iron coffee pot and maker. It turns out that a cup of java made with 400 year old technology tastes wonderfully good and looks sharp on the table as well. Good article. It underscores a big plus in Japanese culture which is it’s willingness and ability to keep it’s artisans productive and gainfully employed. Here in the west (I’m Canadian) we used to have what was called cottage industries. These were crafts like knitting or making snow shoes. Now about the only cottage industry that still has any economic traction is maple syrup production and even it is run to a large extent by the big distributors. Having a strong national identity with an attendant artisan industry is healthy economically and psychologically. As modern economies push employees into contract work with no long term job security we in the west would do well to encourage what was once a thriving cottage industry steeped in our national heritage. Look forward to your future articles.